For the 2018 Dakar Biennale “the red hour", curated by Simon Njami, artist Yasmina Alaoui is presenting 4 new works from her series “sediments”. This new body of work explores the artist’s relationship to her roots in Northern Africa and the post-colonial world in which she exists. Alaoui’s works pay homage to historic narratives of her Moroccan upbringing, including the pre-Islamic fascination with ruin. Referred to as "al-waqfa `ala al-atlal” this poetic motif considers a site of ruin as a starting place, a new beginning. In Sediments, Alaoui sourced geodes, salt, gravel, pigments, plaster and natural debris from the desserts near her home in Marrakesh, tethering it all to large wooden panels. The resulting projections are vast landscapes of detritus, each telling a narrative of ruination. 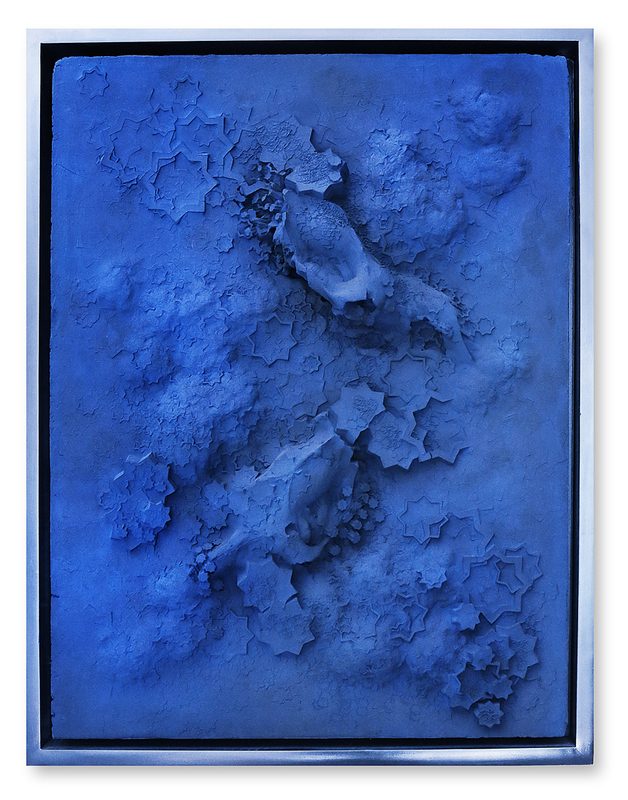 Each work is expressed in high-contrast pigments of gold, black Kohl dust, and Touareg Indigo pigment. In some works, Alaoui traces histories of appropriation in this coloration, returning cultural heritage to her homeland. The indigo pigments she uses, for example, are derived from an ancient practice by the Saharan Touareg people which was appropriated by distinguished artists like Jacques Majorelle and Yves Klein, who rebranded the pigment with their own monikers. While Kohl is used across the Arab world as a source of eye-makeup, protection from evil spirits and medicine. Imbedded in each work, opposing forces of past and present resolve. Finally, Alaoui inscribes Islamic geometries across the wood boards to decorate and unite the mélange of materials. These intricate patterns, layered amongst the many folds of color and object, organize the works and allow for deep introspection into the many visual pleasures originated by Berbère, Arab and African societies that constitute Morocco, and appropriated by the Western world. For Alaoui, her organization of these sites of ruin allow for a starting point; her emancipation, her Red Hour, and an exclamation to the constant unfurling of history.